Chapel-le-Dale is blessed with a myriad of beautiful walks. From the long distance paths, hill-top expeditions, set routes and gentle strolls. There is something for everyone. 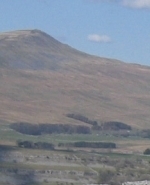 The famous walk over Ingleborough, Whernside and Pen-y-Ghent. Traditionally a challenge of 12 hours, or more leisurely over 2 or 3 days. Passing through Chapel-le-Dale the famous Waterfalls Trail has some of the most spectacular waterfall and woodland scenery in the North of England. 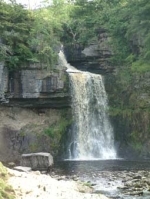 The trail is 4.5 miles/8 kilometres through ancient oak woodland and magnificent Dales scenery via a series of spectacular waterfalls and geological features. The Dales Way is a long distance footpath of about 80 miles (129 km) situated in the north of England and running from Ilkley to Bowness-on-Windermere. The famous long distance Pennine Way passes the head of Chapel-le-Dale and you can walk sections of the route. An exhilarating 90 miles across the glorious high country of the Yorkshire Dales from Saltaire to Appleby-in-Westmorland. Explore its rich history, geology and culture. Return with a breathtaking train ride along England's most beautiful railway. The reserve of 42.6 hectares lies at an altitude of approximately 323m amidst dramatic scenery. Here, the typical features of limestone country – the scars, the potholes, the limestone pavement and the limestone grassland – may be seen, along with a remarkable variety of ferns and flowering plants. An alternative 1.5hr 2mile walk around the Southerscales nature reserve. This fascinating short walk takes you into and around a disused quarry which is being recolonised by nature. 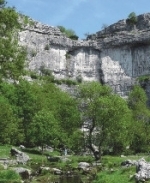 The walk explores an area of limestone pavement and visits a Viking age settlement. The walk is approximately 2.5 kilometres long (1.5 miles) and should take approximately 1 hour to complete. A 1hr stroll through the limestone quarry, and around the ancient farmstead of Gauber.